The United States and China are the two largest economies in the world; in terms of direct investment in each other’s economies, they are also among the world’s underperformers. Negotiations to produce a US-China Bilateral Investment Treaty (BIT) could change that situation dramatically, delivering a significant economic payoff to both countries. 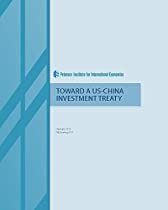 In this volume, experts at the Peterson Institute for International Economics analyze the roadblocks to those talks and outline steps that a BIT must take to encourage foreign investment and to establish reciprocal rules for the treatment of firms and protection of investments. US-China BIT negotiations were initiated under the presidencies of George W. Bush and Hu Jintao, but progress faltered in 2008 as US economic priorities shifted in the Great Recession. Negotiations resumed in late 2014. Among the challenges are China’s historically less ambitious agreements, a laborious legislative process to enact investment treaties in the United States, US concerns about national security, and Chinese policies that impede foreign investment. Scholars examine these issues and possible ways to resolve them.